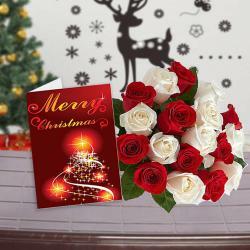 Product Consists : Basket arrangement of 15 Gerberas and Roses with some green filliers along with Christmas Greeting Card. 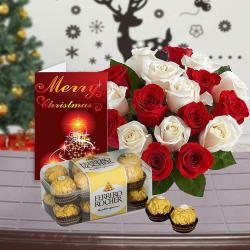 This wonderful gift combo is a perfect gift to enthrall anyone. This gift combo contains one flower basket filled with fifteen roses and gerberas. The flowers are arranged very beautifully on the basket that it looks like a flower showpiece. The beautiful yellow and white flowers with green leaves garnishing makes this flower basket looks very attractive. You can gift this flower basket to your wife on this Christmas and it will surely make her feel special. 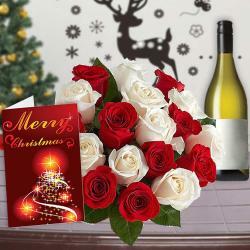 There is one Christmas greeting Card also available on this gift combo. You can write down your message for the receiver on this greeting card. This gift combo is perfect for Christmas gifting. 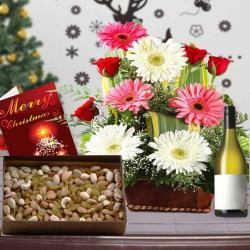 Product Consists : Basket arrangement of 15 Gerberas and Roses with some green filliers along with Christmas Greeting Card.